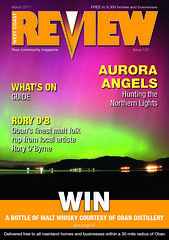 NOTE: Previously published and subsequently lost to an evil electronic gremlin, it only recently came to my attention that this had not been republished. The day of our Joe Danger: Special Edition review seemed as good a time as any to put it back up again. 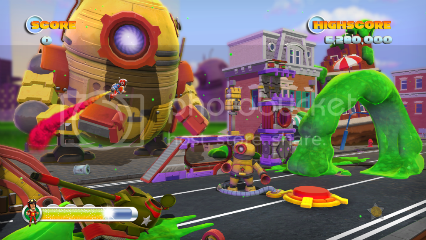 If you’ve already played Joe Danger, you’re almost certainly excited for Joe Danger: The Movie. If you missed that game for whatever reason, check out our Hello Games interview and Joe Danger review (oh go on then, the preview as well) to find out why that title is so darned loved. Done it? Everybody ready? Okay. No longer restricted to his motorbike, stunt rider Joe now laughs in the face of death and twiddles the nose of peril using a variety of vehicles. Yes, there’s a police motorbike in there; but in the demo levels I played there were also a minecart, a snowmobile, a pair of skis (“not sure if skis count as a vehicle!” admits Hello Gamer Sean Murray) and… wait for it… a jetpack! That got the last of you on board, I think. The ground-based transportation used the same control method as the first game; hence you’ll still be performing tricks to fill your boost meter, wiggling about in mid-air in a vain attempt to collect all those stars first time around, ducking then jumping with painful precision, and so on. 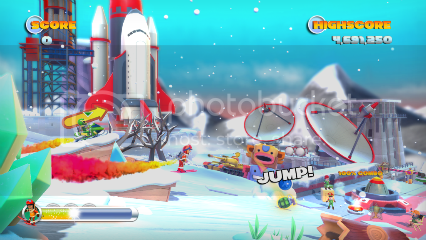 It’s still very much a racing/platforming/stunting (henceforth known as ‘raplunting’ at Critical Gamer) game, and will be instantly familiar to Joe Danger fans – yet it’s oh so different. Firstly there’s the ‘scripting’, hence the word Movie in the subtitle. Murray was keen to stress that there won’t be any lengthy cutscenes or anything like that; but there will be what I feel the need to pretentiously describe as ‘dynamic context’ (forgive me) for what Joe’s doing and why he’s doing it. For example, one level saw Joe punching other riders in the face, knocking them off their bikes. This isn’t because indiscriminate violence is fun (well, not entirely), but because these are the baddies of the movie scene. Another, snowy level sees Joe zooming down a mountain with targets to land on. Said targets are actually rockets slowly rising from silos; fail to land on and disable them (blow them up), and they launch. And then, one presumes, Bad Things Happen. Once you’re past the rockets the bad guys, none too pleased at your do-gooding antics, chase after you and lob grenades in your way. Red grenades you need to duck under and green you need to jump over (or was it the other way around?). You have what I estimate to be 0.3 milliseconds each time to identify what type of grenade it is and take appropriate action. Funstrating! You’re also now able to change lanes at any point on the magic green line (as I found when I repeatedly smashed into oncoming traffic), but the biggest dollop of new was smothered over the aforementioned jetpack. Although I was assured (twice) that the controls for this were considered fiddlier than they should be and were in for some tweaking, I found it fun and easy to use. Especially surprising considering my bloody awful performance for the first five minutes or so of play using the easier vehicles. It’s perhaps best described as like riding your bike in zero gravity. Accelerate pushes you forward in the direction you’re facing, holding brake sends you backwards; but you can go in all directions rather than just left and right, and boost works both forwards and backwards. This has a lot of potential for the risk and reward Joe thrives on, hinted at in the demo. Do you want to bypass hazards wherever possible and finish the level as quickly as you can, or brave the route full of instakill to scoop up all the collectables? There will be many more vehicles in the final game, and some – such as a promised parachute and hang-glider – will use a similar control method. The half dozen or so levels on offer were tightly designed, sometimes bordering on evil (would fans have it any other way? ), and above all fantastic fun. I was surprised, therefore, to find that they’d all been made in just three weeks; a mad rush with fantastic results to get something playable together for the game’s first public outing at GamesCom. Nonetheless, it’s not necessarily representative of the final game. It sounds like the newer elements will be pushed much further to the fore in the finished product, and certain features were of course missing at the expo. The plan, it seems, is also to assign certain types of level to certain types of vehicle. So for example, skis might be used primarily for stunt levels, bikes for race levels, jetpacks for score attack levels (I must stress here that these examples are pulled from my own fevered mind). Brilliantly, vehicles you unlock as you play can then be used in previous levels to play them in a completely different way. Although I was at the Eurogamer Expo for nine hours, I didn’t actually have time to play very many games. 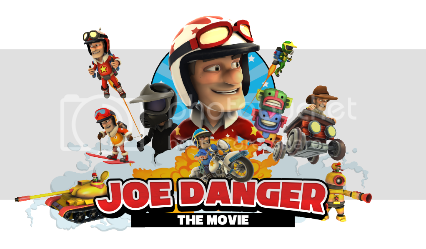 Joe Danger: The Movie is the only title I went back to for a second go. It’s going to be the best raplunter you ever play. I do have one, huge criticism however; I can’t buy it yet.